Bryan got me a Mother's Day present, but he couldn't bear to wait until May to give it to me. It's a slackline! It's a lot like a truck tiedown strap, made of heavy yellow synthetic webbing with a burly buckle to pull it tight. It's supposed to be looped around a tree at each end and tightened to take out as much sag and wiggle as possible. And we're supposed to walk on it. 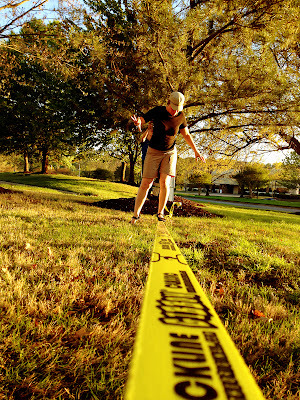 Slackline contests are popular with climbers, and I can see why - it's fun. But also really, really hard. The first time my foot pushed down on the line, it waggled uncontrollably back and forth. I looked down, feeling a little betrayed- what was wrong with my foot and ankle, that they were behaving so unpredictably? I tried looking forward, but it didn't help. I actually grabbed my knee and calf, hoping to steady my foot, but it continued flailing back and forth wildly. Bryan took a turn, then Mitch, then Monkey and Nick. I think they all thought 'oh, I can do a ton better than that.' But we were all equally awful at it. Finally, after some practice, we got better. 'Better' meaning "can sort of stand on one foot for about two seconds." Maybe by Mother's Day I'll actually be able to walk on the damn thing. I've always wanted to try one! My turn next! For sure! It is easily portable and quickly set up. It's harder than I thought but iy'll get easier with practice as our muscles get used to being used this way.